Each year more fitness tracking wearables are released, expanding the variety of devices on the market. While the options are nice, it can become a little overwhelming trying to determine if you need to upgrade the device you have or if the one you have is up to snuff with everything else. Wrist fitness trackers are typically easy to use and can be comfortable if you find the right one. Wrist wearables often do a sufficient job of tracking, but many users want their wearable to do a little more, such as have some of the same features as a smartwatch. If you’re ready to get more from your traditional wrist tracker, a fitness tracker with smartwatch capabilities may be the perfect everyday accessory. Fitbit Blaze is a wearable wrist device that acts as a fitness tracker and a smartwatch. Whether you’re in the middle of a project at work or going on a morning run, you don’t need to wear a watch, a fitness tracker, and carry your smartphone; everything you need is in the wearable device. Available in three sizes and a variety of band designs and colors, as well as watch face colors to choose from, the Fitbit Blaze is an attractive timepiece, suitable for casual and formal environments. Removing the tracker/watch face, which is a black plastic square, is easy for swapping out different bands (if you want to change up your look from day to night). Similar to other fitness trackers that you can wear all day long, Fitbit Blaze monitors and tracks everything from the steps you take throughout the day, and the number floors climbed to your active minutes, stationary time, and calories burned. You can also learn more about your movement and health while you sleep. The wearable device is comfortable and convenient enough to wear to bed so that you can track your sleep stages, from light to REM, and find out if your quality of sleep needs improving. If your schedule is chaotic or you work in a stressful occupation, Blaze will prompt you to take a moment to pause with a breathing session. This action is prompted if the device reads that your heart rate is higher than average, but you’re not exercising. The tracking screen (which also doubles as the watch face) works similarly to a smartphone. With a touchscreen and side buttons, you can start and stop a workout, read your health stats during or after your workout, and also see texts, calendar reminders, incoming phone calls, and control music playback from your phone. When you connect with Bluetooth LE and an Internet connection, Blaze can send smartphone notifications and can also sync automatically to computers or other mobile devices. The syncing range is up to 30 feet. Fitbit Blaze can sync with Mac OS X 10.6 and up, iPhone 4S and later, iPad 3 gen. and later, Android 4.4 and later, and Windows 10 devices. Music control via Bluetooth Classic on Android, iOS and Windows devices. When your smartphone is nearby (up to 30 feet), you can use your favorite apps, place a call and even text from the device. You can also enable GPS to map your routes for running and walking. Wrist-based heart rate monitoring means no bulky or uncomfortable chest strap (for the fitness tracker). Continuous heart rate monitoring and the ability to get a “quick read” while working out takes the guesswork out of your heart rate (whether it’s too high or too low). The wrist device is comfortable enough to wear all day and even while you sleep so you can monitor your sleep, steps, heart rate, and calories (among other things) 24/7. Fitbit Blaze is not waterproof so you can’t shower with it on or use it to track your heart rate and checking other health stats while participating in water sports like swimming. If you use the built-in workout sessions via Fitstar, the device doesn’t keep track of reps nor does it keep score of your performance for each exercise. While the built-in exercises, there’s little motivation to use them as you can’t really “progress” to another level. Blaze is larger than other Fitbit devices so if you’ve used a Fitbit wristband in the past, you may have a hard time adjusting to a larger wearable wrist device. Like every new device, learning and remembering all the steps to finding and utilizing the features can take a little bit, but once you have it figured out, Fitbit Blaze is easy to use. Since Blaze is more or less like a miniature smartphone, you can control many of the features by swiping and touching icons on the screen to open functions and menus. Once you take a little time to customize the settings to your liking, such as adding or removing certain types of exercises, you can visit the Blaze app at any time to see your daily performance and watch how your body, sleep, and other health stats improve the more you work out. The memory saves daily totals for the past 30 days and can keep seven days of detailed, minute-by-minute motion data. The memory is also able to store your heart rate data at one-second intervals while you exercise and five-second intervals during the rest of your day. While the memory is impressive for a small device, it’s limited storing capacities can act as a motivator for you to check in on your progress and see where you could or need to make improvements. With a lithium-polymer battery that has “life” for up to five days, you can spend more time working out and wearing your device 24/7 and less time trying to remember to charge your device. As with all wearable devices, the life of the battery will vary, in between charges, based on the level of activity, your settings, and other factors. The charge time takes about one to two hours, so it’s most convenient to charge it when you need it the least. Some fitness trackers do the bare minimum by monitoring your heart rate, counting your steps, and maybe tracking your caloric intake. While these “bare bones” options may be enough for you, and Fitbit Blaze offers all of these, you can always start out small and slowly get to know your Blaze device. As soon as you set up your Fitbit Blaze and start wearing it, it will track your activity all day long. This means that each step you take is counted as well as your distance and whether or not you climbed any stairs during the day. It also keeps track of your active and stationary time and tells you how many calories you burned throughout the day. The device acts as a gentle motivator throughout your day by encouraging you to take at least 250 steps every hour or to take a quiet breathing break when your heart rate is getting a little high due to stress. While you can ignore all the friendly reminders and suggestions, it may be a way to help you incorporate healthier habits throughout the day not just when you exercise. Where other fitness trackers only give you the stats, Fitbit Blaze has the ability to monitor your movements from sunrise to sundown. It also stores the information and helps you understand what’s going on in your body throughout the day. If you want to make improvements, you have a better idea how to make positive changes. Many fitness trackers will continuously monitor your heart rate but a select few have the ability to monitor and track your light, deep, and REM sleep stages so that you can better understand your sleep quality and make improvements if needed. Comfortable To Wear: Like any device (or any wristwatch) it may take a little getting used to before the Fitbit Blaze becomes hardly noticeable. The key to comfort is selecting the right size wristband. The band comes in three sizes: Small (5.5-6.7”), Large (6.7-8.1”) and Extra Large (8.1-9.3”). The bands are available in leather, nylon, and metal. Compatibility: Unlike other fitness tracking devices, this wearable fitness tracker is compatible with iOS, Android, and Windows devices. You can sync up your stats wirelessly and automatically to computers and over 200 compatible devices. Easy to Care and Clean: The Fitbit Blaze is easy to care for and clean. Keep in mind that while it’s not a waterproof device, it is water resistant. If you sweat while wearing the device or if it gets wet, simply remove the band and dry it completely. Giving your wrist a rest is always a smart idea (when you charge or during inactive times) and try to keep your wrist clean. Accessories Included: One of the nice things about owning a fitness tracker/smartwatch is that there are few accessories needed. 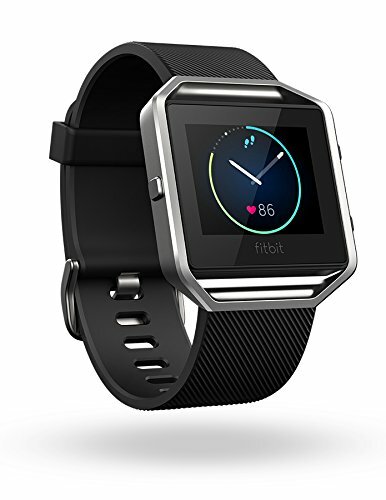 The Fitbit Blaze comes with the tracker, the classic Blaze wristband, the stainless steel frame (that the tracker fits into), and a charging cable. Other wristbands are sold separately. Works in a Variety of Temperatures: If you get caught in the rain while running, your device is water resistant but try to avoid long exposure to water (and never fully immerse it in water). Whether you’re cross-country skiing or attending a hot yoga class, the Blaze can operate in temperatures between -4° to 140° F. It also functions in altitudes up to 28,000 feet. Not sure if you want to invest in a fitness tracking smartwatch? We’ve done all the research, worn the device, and talked with users of various fitness levels and athletic abilities. Check out all the positive things that people have to say about the Fitbit Blaze. Users of the Blaze can’t say enough good things about the versatility of the device. Not only did they love the variety of options and the 24/7 monitoring but for many, the device made them accountable for their choices (from exercising to eating) and was motivating overall. While the Fitbit Blaze reviews on Amazon were mostly positive, the biggest complaints were the sensitivity of the motion tracking (such as counting steps). Some users were skeptical that some of the readings weren’t accurate and were irritated that every movement they made was mistaken as a step. As with many fitness tracking devices, users need to take into account that while a high-quality device like the Fitbit Blaze is accurate, there are typically a few steps, more or less, that may affect the daily totals. Learning how to use the device properly and using care when touching the screen (and other buttons) or even adjust the settings, can help reduce any inaccuracies. While the Fitbit Blaze has quite a few more features than other fitness trackers on the market, you may be wondering if the fitness tracking smartwatch is the right accessory for you. This device is a great option for anyone who wants to achieve fitness goals. Whether you want to learn how to improve your sleep patterns or need a little extra prompting to get more steps in each day, the Fitbit Blaze is a comfortable, convenient, and easy to use the wearable device. Perfect for a morning at the gym and to wear all day at the office, you can continue to wear the device during a cocktail party and while you sleep at night making it the ideal everyday accessory.